This story comes from Lia Pignatelli, a rehabber with AKUSA Wildlife Rescue in Brewster, NY, who specializes in songbirds. It was six o’clock one June morning, and Lia arrived in her bird nursery room for the first feeding of the day. She checked her brood: a nestfull of Tufted Titmice, a Mourning Dove, a robin, and a cardinal. All eyes turned to Lia, and the begging began. She turned on her Nature Sounds CD, and readied the mealworms. Suddenly she heard the unmistakable sound of a young Blue Jay. Songbird rehabbers learn to recognize the begging cries of various birdlets the way an English-speaking tourist learns to recognize European languages: that’s French, that’s Spanish, that’s German. If the tourist keeps at it, she’ll start learning words, and if the rehabber keeps at it, so will she: I’m hungry. I’m really hungry. Can’t you see I’m starving, here? The Blue Jay sound continued. Lia went outside, expecting to see a cardboard box on her driveway and a car pulling away. Nothing. She circled the house. Finally she reached the front door and there, sitting on the welcome mat, was a pre-fledgling blue jay. She triumphantly scooped him up, happy that her sanity was still more or less intact. But how did he get there? She knew there were no blue jay nests around her house. He was too young to have coasted out of his nest, landed on the ground, and hopped for any distance. Perhaps a crow or a hawk could have grabbed him, flown away with him, and dropped him by mistake, but he had no injuries. Maybe, she thought, she was on one of those reality shows where they play practical jokes on people. She looked around for the hidden cameras. She called to her friend, Pat. The camera crew never appeared, so she put him in with the cardinal and the robin, since they were about the same age. She called her rehabber friends to see if anyone else had a young blue jay, but came up empty-handed. Within a week all three birds were hopping around Lia’s flight cage, scavenging the ground for the worms and crickets she’d toss inside to prepare them for the outside world. After she released them, they all stayed around the house, happy to accept the free supplementary mealworms she left out each morning. Soon the cardinal and the robin began staying away for longer and longer periods, but the Blue Jay remained. 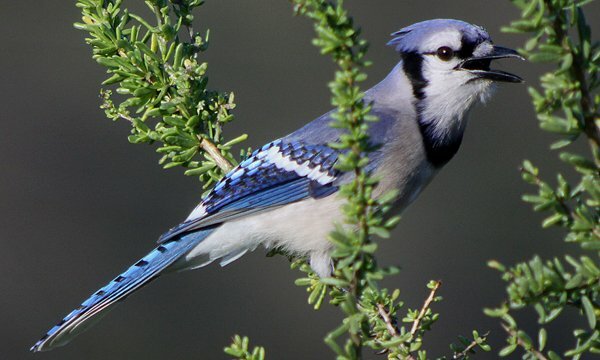 Then one morning she heard – above the chirps of the current flock of babies and the Nature Sounds CD – the cry of an adult Blue Jay. “Oh, not again,” she said, hurrying to the welcome mat. But en route she spotted the adult jay in a nearby oak tree, and behind her, two fledglings. During the next few days a family of four appeared during the day, helped themselves to the mealworms, and eventually absorbed Lia’s little orphan into their group. Was this his real family? There was no way of knowing. What a beautiful bird and a delightful story. I loved it! Concur. A great story – thanks for sharing.